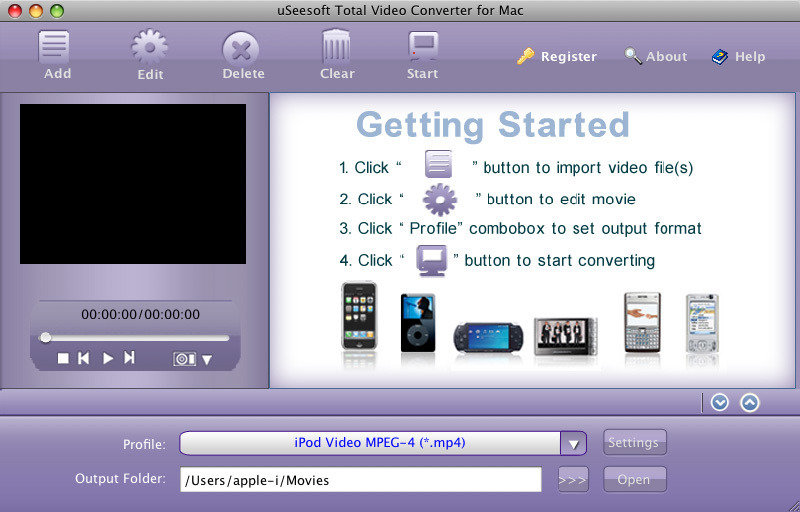 uSeesoft Total Video Converter for Mac is a easy to use video conversion tool on Mac. It can convert video between various video formats including AVI, MPEG, MP4, MPG, DivX, 3GP, 3G2, MOV, FLV, VOB, Xvid, MKV, M4V, ASF etc, and also extract audio from video/audio files to MP3, AC3, M4A, OGG, and AAC formats. In addition, it can be used like iPod/iPhone/PSP/3GP/PSP/Zune Video Converter that convert video to your portable devices. ...... Apple iPhone, Zune video player and other portable video players. Additionally, it provides an easy way to convert video files to popular audio file, like MP3, AC3, M4A, AAC etc. This best Mac video converter works perfectly with almost all the popular video/audio players, such as iPod Touch, iPod Nano, iPod Classic, iPhone, Apple TV, PSP, Zune, Creative Zen Vision, Archos, iRiver, HP iPAQ, General Pocket PC, Black Berry, Xbox360, PS3, Youtube, Mobile Phone. The best video converter for video editing functions is out of your imagination. It allows you to trim video/audio, crop video image. It also enables you to set the specific values of your output video and you can preview the video effect before conversion. Qweas is providing links to uSeesoft Total Video Converter for Mac 1.5.0.5 as a courtesy, and makes no representations regarding uSeesoft Total Video Converter for Mac or any other applications or any information related thereto. Any questions, complaints or claims regarding this application uSeesoft Total Video Converter for Mac 1.5.0.5 must be directed to the appropriate software vendor. You may click the publisher link of uSeesoft Total Video Converter for Mac on the top of this page to get more details about the vendor.